* Booth space is limited so these will be reserved on a first come, first serve basis. Start planning for the 2019 TOFGA Annual Conference! Every year hundreds of farmers, ranchers, and gardening enthusiasts attend from all over Texas to share ideas, network, build community, and and connect with industry professionals such as our exhibitors and sponsors. The conference includes two days of learning sessions, plus multiple add-on pre-conference workshops and farm tours. Be sure to join us for the Friday night banquet featuring keynote speaker, Ellen Polishuk, and a delicious locally-sourced dinner. Become a sponsor today! Introduce your business to the growing sustainable ag movement and reach over 300 conference participants as well as countless others with an online presence leading up to the event on the TOFGA website and social media. The Texas Organic Farmers & Gardeners Association is a statewide non-profit 501(c)3 organization focused on education and advocacy for Texas farmers, ranchers, and gardeners who practice organic and sustainable methods. Established in 1993, TOFGA is a member-run and member-funded organization open to all individuals interested in the production and consumption of organic and sustainable products in Texas. 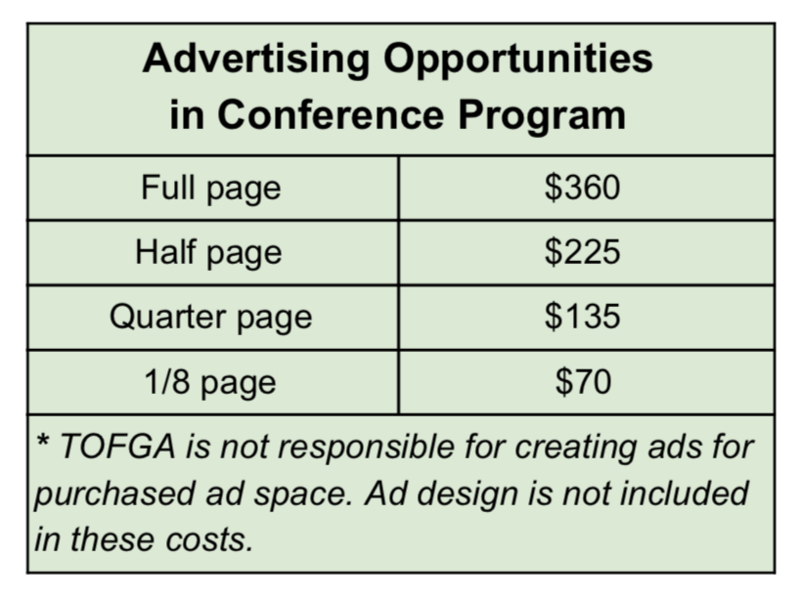 Please know that your sponsorship fees are what allow TOFGA to put on this conference every year. Thank you for helping to make this event possible! * Booth participation is not required but is a perk of sponsorship. Booth space is limited and will be reserved on a first come, first served basis. Beyond what is included in your sponsorship package, up to two additional sponsor registrations are available for $150 each. Join TOFGA for a delicious farm-to-table dinner and an inspiring program! Beyond what is included in your sponsorship package, up to two additional banquet tickets are available for $35 each. Stay tuned for more details later this fall! TOFGA Special Rate: $119 per room plus taxes, good through Friday, January 25, 2019 or until all TOFGA rooms have been reserved. Reserve by phone or at this link. Each booth includes one draped 8’ table, two chairs, and a wastebasket. New this year! A special opportunity for exhibitors to sign up for a time slot to give a short presentation or demonstration at their booth about their product or services. These will take place during the conference breaks and will be posted on-site for participants to take note of. Ads are due to admin@tofga.org by Tuesday, January 29!